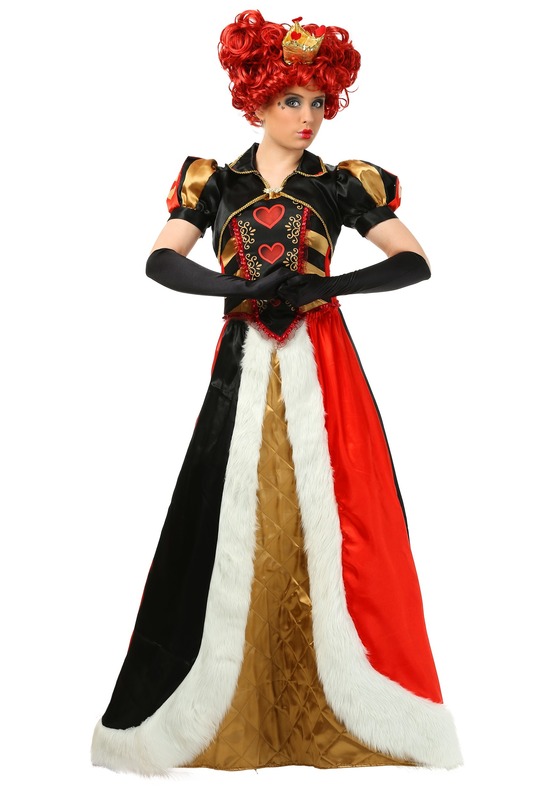 We are featuring gorgeous Adult Deluxe Queen of Hearts Costumes. 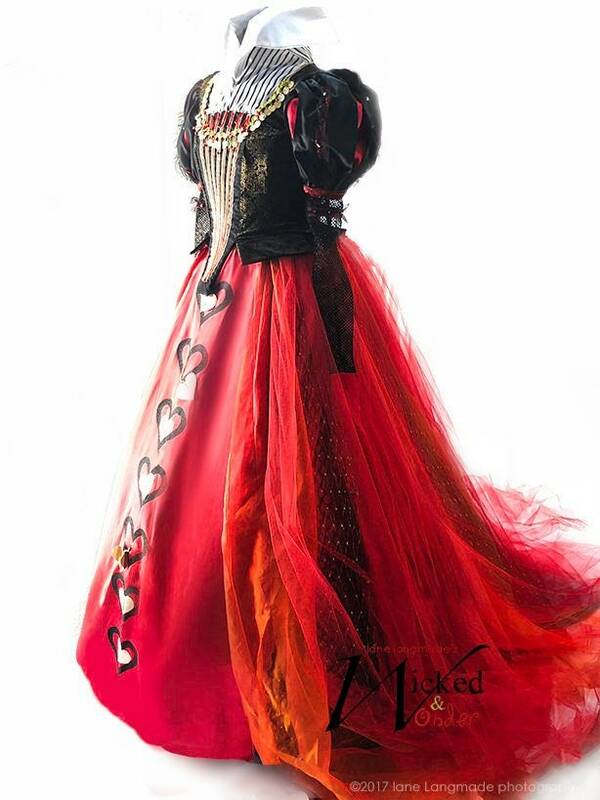 They are high-quality cosplay Queen of Hearts and Red Queen gowns in a variety of styles and fabrics. They are perfect for cosplay or theater events. 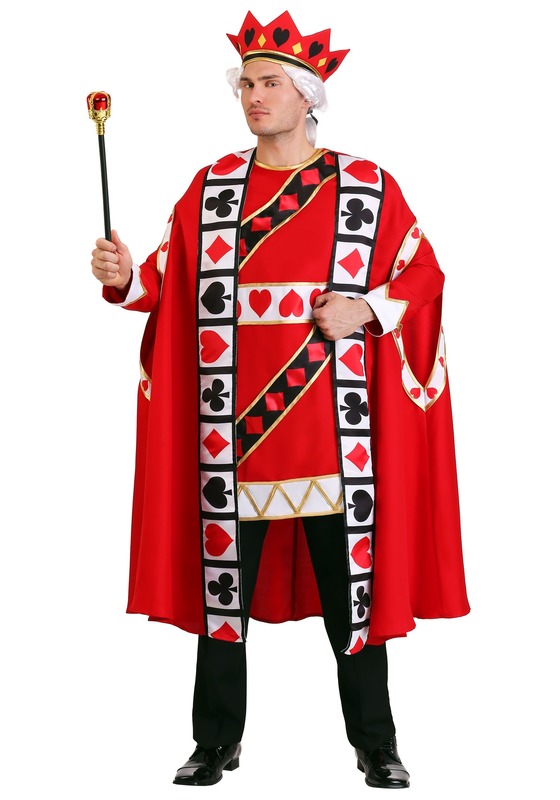 In addition, we are also featuring several King of Hearts Costumes. Pairing the Queen of Hearts and the King of Hearts is a great idea for a couples costume at a Halloween party or a Masquerade Ball. 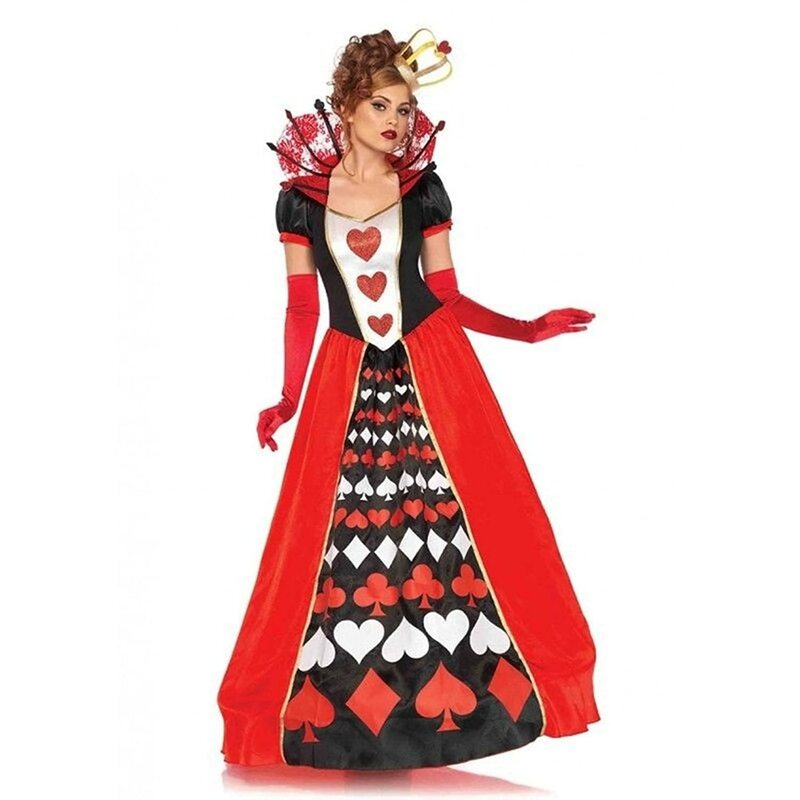 For the adult women looking for an easy regal costume, we are featuring a few Queen of Hearts Playing Cards costumes along with a few King of Hearts Playing Cards Costumes. They too will make fabulous regal couple costumes for a Halloween party. The Queen of Hearts and the Red Queen are actually two different characters in the original Lewis Carroll’s fantasy novels. The Queen of Hearts is from Alice’s Adventures in Wonderland and the Red Queen is from Alice through the Looking Glass. To simplify matters we are combining the two even though they are really two very separate characters. 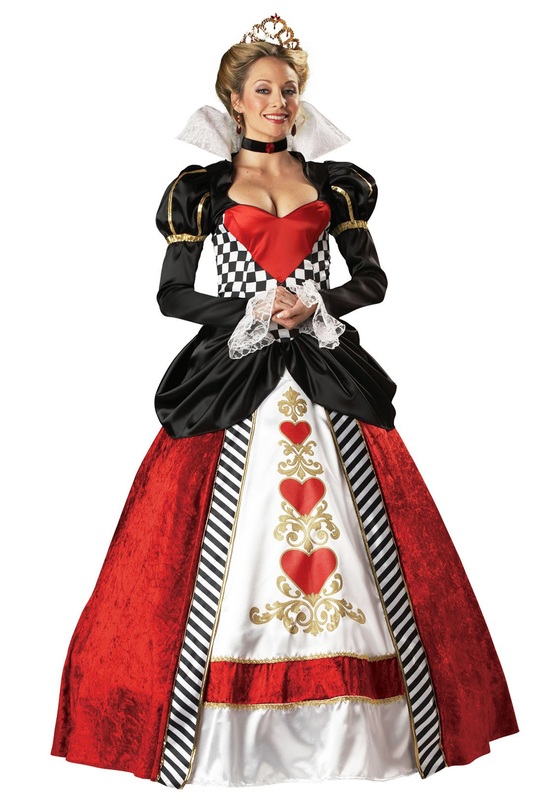 The following Queen of Hearts costumes are all costumes replicated from both Alice’s Adventures in Wonderland and Alice Through the Looking Glass Tim Burton Disney movies. They are all made from the highest quality of fabrics and materials. 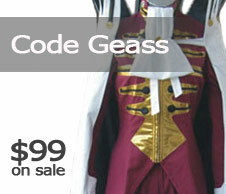 They are costumes perfect to wear to either cosplay events or in theater products. As any serious cosplayer, actor, or costumer knows, for a costume to be the best in portraying a character, it must be unique as well as accurate. Detailed accessories are a must to complete the look of any costume. 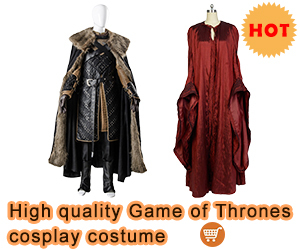 I searched for and found the best well-made, unique, yet accurate replicated costumes I could find at fairly reasonable prices. This helps you by making your search time that much easier and cost-effective. It can cost a pretty penny (often well over $800 to thousands of dollars) to purchase handmade fashion costumes from Etsy or other online professional seamstresses and tailors. The next costume is an example of an Etsy Adult Iracebeth Red Queen Costume. The costumes I have selected to feature, are the next best alternative. 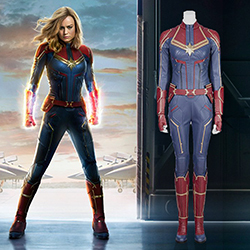 Many of the costumes can be custom made, tailored to your exact measurements in China, at no extra cost, and for so much less than an American custom made costume. After all, China is now and has been for decades the leading manufacturer of textiles in the world. 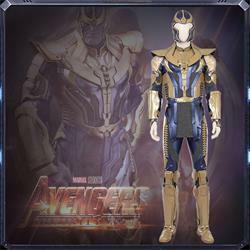 Costumes handmade in the USA and the UK are usually much more costly when they are high-quality costumes. 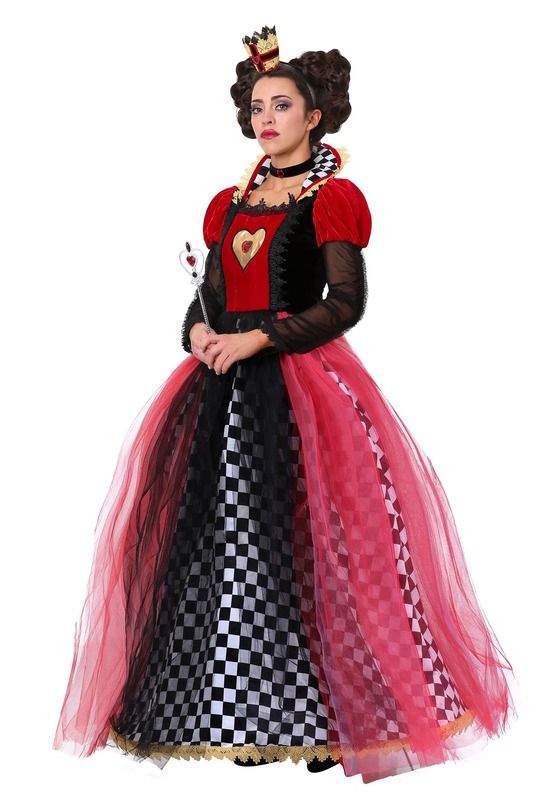 The Queen will love ruling over the chessboard wearing this beautifully tailored-by-hand Red Queen dress costume. It is replicated from the Johnny Depp, Tim Burton movies. The black satin bodice has sheer organza sleeves with satin and lace embellishments and a red and white striped front. A gorgeous red asymmetrical skirt with black and gold heart appliques cascading down the front is attached to the bodice. The skirt is lined with an adorable black, red and white print. A pair of red bloomers adorned with 3 tiers of ruffles at the hem are included with the dress. At first glance, each one of these Red Queen of Hearts costumes looks identical to each other but each one has subtle differences in the design and the fabrics. All three of the Queen of Hearts gowns featured above are very well made and can be made to order for a customized fit. 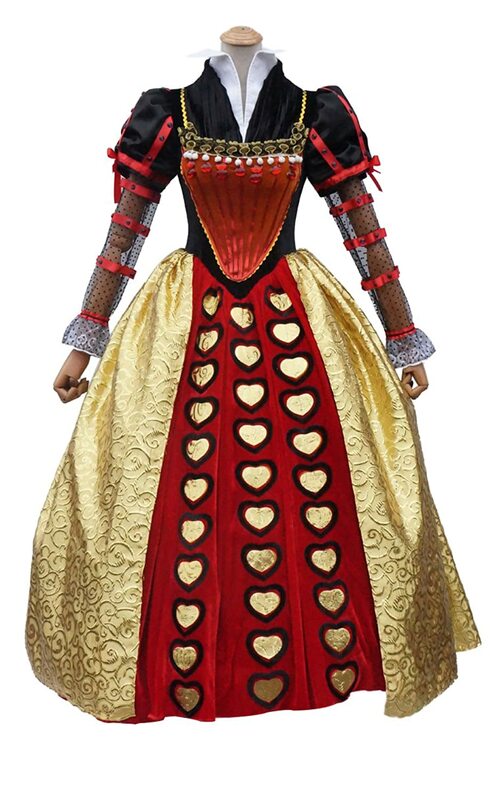 As mean and nasty as the Queen of Hearts appears in the story, you will look fabulous wearing this Queen of Hearts gown, even when threatening to cut off everyone’s head. How can a playing card be so nasty? 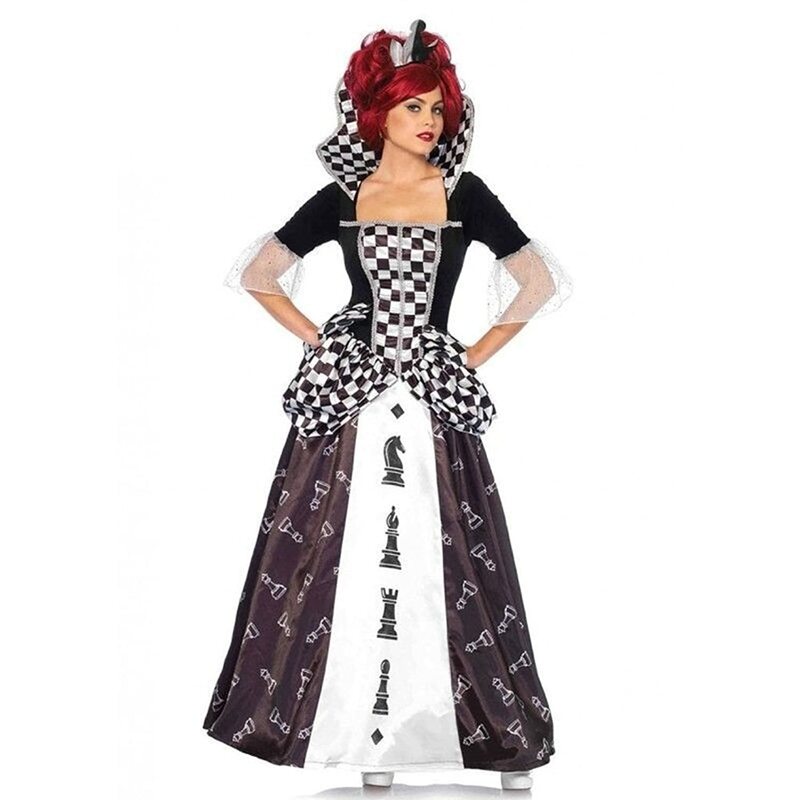 The Queen of Hearts dress has a 2-toned red satin bodice with black and white checkered pattern detailing. The mutton style sleeves are puffed with elegant gold trim and white lace flounces at the fitted wrists. A red, crushed velvet poly/spandex blend floor-length overskirt is trimmed with a black and white stripe print and has an attached black satin overlay at the waistline. The white underskirt front panel is printed with a row of red hearts and gold scrolling. A wide contrasting red stripe edged in gold, accents the hem of the skirt. Also included are a full-length white tulle petticoat, a choker, and a sequin heart crown. Shoes are not included but they can be purchased separately by clicking this link. Talk a walk through the fantasy world of Wonderland ready to rule wearing this 1-piece Queen of Hearts ball gown to your next Halloween bash. Drive everyone mad, mad, mad, and a little bonkers too when you walk into the Halloween party looking like royalty while threatening to send heads rolling. This Queen of Hearts ball gown is not as elaborate as the amazing cosplay gowns featured above, but it is more affordable and it will be fabulous for a Halloween party Queen of Hearts. The gown features a floor-length red skirt with a black, red, and white front panel printed with playing card symbols including hearts, diamonds, spades, and clubs. A fitted v-point bustier-style top with a white front panel and red hearts printed in a row down the front is attached to the skirt. The top has black satin side panels attached to black puffed sleeves trimmed with red bands. The top panels and v-shaped neckline are all trimmed in gold. A fabulous upright sheer red designed collar with black stays is attached to red and black collar lapels. 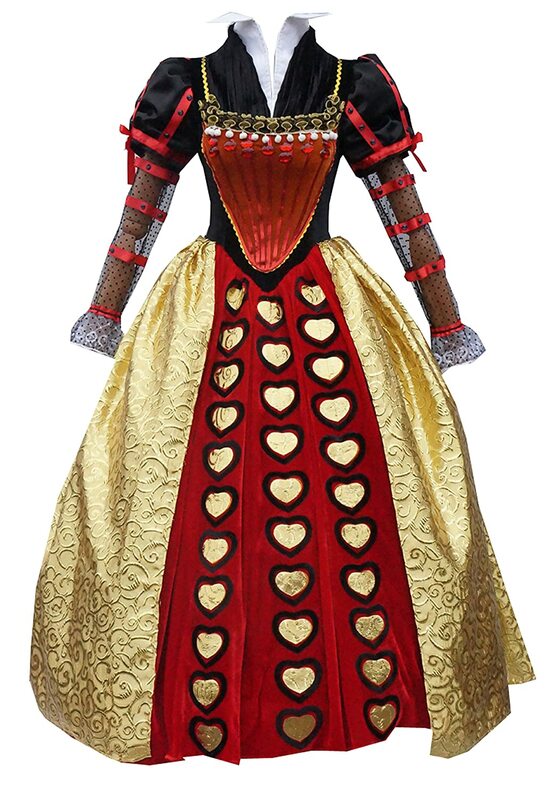 A crown headpiece is included to complete this Queen of Hearts costume. I recommend purchasing a different Queen of Hearts crown or a tiara headpiece. The one that’s included is rather flimsy and might not make it through one use of the costume gown. In addition, I recommend purchasing a hoop style petticoat, to achieve the fullness seen in the photo, and a pair of red opera length gloves as the red gloves pictured are NOT included. 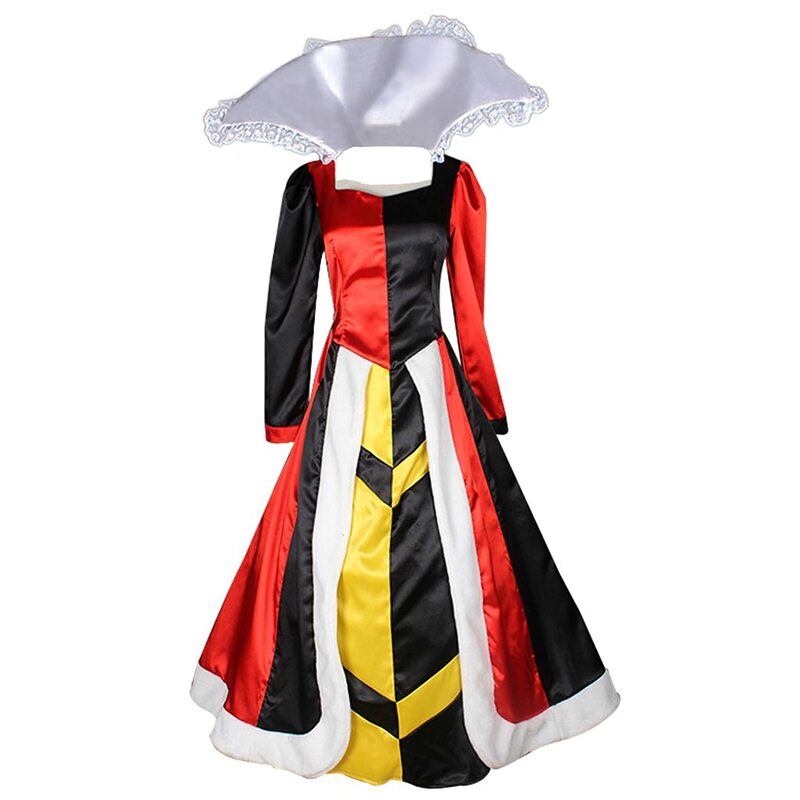 An inexpensive alternative to the Queen of Hearts cosplay costumes featured above. The gloves, accessories, and the wig are not included and may be purchased separately by clicking the links. The next sets of costumes were inspired by the costumes created for the Tim Burton version of Alice Through the Looking Glass film starring Johnny Depp and Helena Bonham Carter as the Red Queen. Inspired by one of the outfits worn by Red Queen in the Tim Burton Alice Through the Looking Glass movie, this dress is a bit more affordable, less elaborate, and more whimsical than the other Queen of Hearts gowns featured above. The front bodice is black velour and the back is black sateen. It has a corset style V-shape front and an attached stiff stand-up white crinoline fabric collar. The bodice is embellished with a variety of trims and jewels as are the long decorative puffy mutton sleeves. The attached skirt comes with multiple layers of organza and satin panels with an attached black net petticoat underneath. The center satin panel, between panels of red satin, has black and gold printed hearts cascading down the front. The top overlayer is sheer organza with a red and gold damask print. The dress looks elegantly evil fit for the evil queen who loves to cheat when playing chess as she threatens her subjects with the loss of their heads. The wig and shoes are NOT included. I recommend wearing another black petticoat underneath to give the skirt additional fullness. “All the ways about here belong to me”, states the Red Queen when on the chessboard moving in any direction she wants. Wearing this handsome checkered outfit you will have all the eyes upon you and not the game in progress. This dress costume includes the dress and the hairpiece, however, the checkered gloves, wig, and shoes are NOT included but they may be purchased separately by clicking the links. Below we are featuring several different King of Hearts costumes. 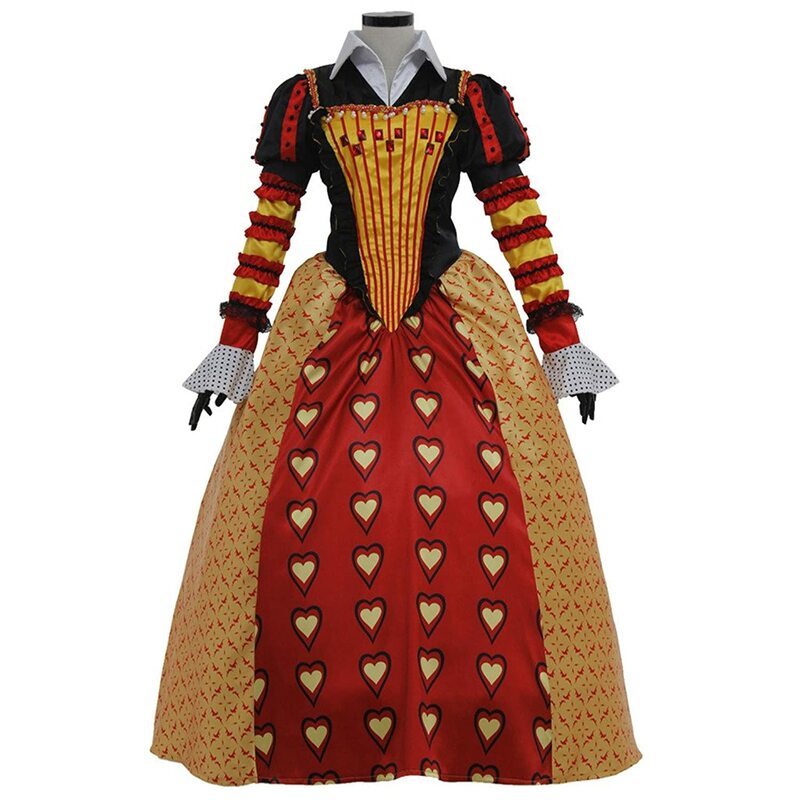 Matched with a Queen of Hearts costume they make the ideal couples costume to wear to any masquerade ball or cosplay function. 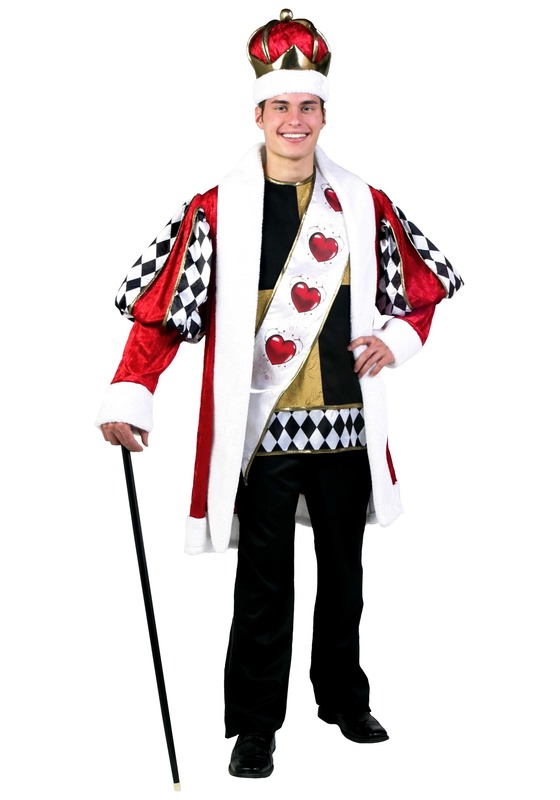 Included with both the regular men’s sizes and the men’s plus size King of Hearts Costumes are the coat, a tunic, a sash and a coordinating crown. The coat is made of black and white diamond pattern satin split sleeves over a red crushed velvet with white faux fur trim. The sleeveless tunic is blocks of yellow brocade and black poplin with a black and white diamond pattern satin band trim. Gold metallic piping trims the neckline, armholes, and hem. The white satin over-the-shoulder sash is printed with red hearts and edged in metallic gold trim. The cane and the pants to these men’s costumes are NOT included. I recommend purchasing a pair of either black or white Renaissance trousers. Wear the pants tucked into a pair of knee-high black leather riding boots to complete the look of the King of Hearts. 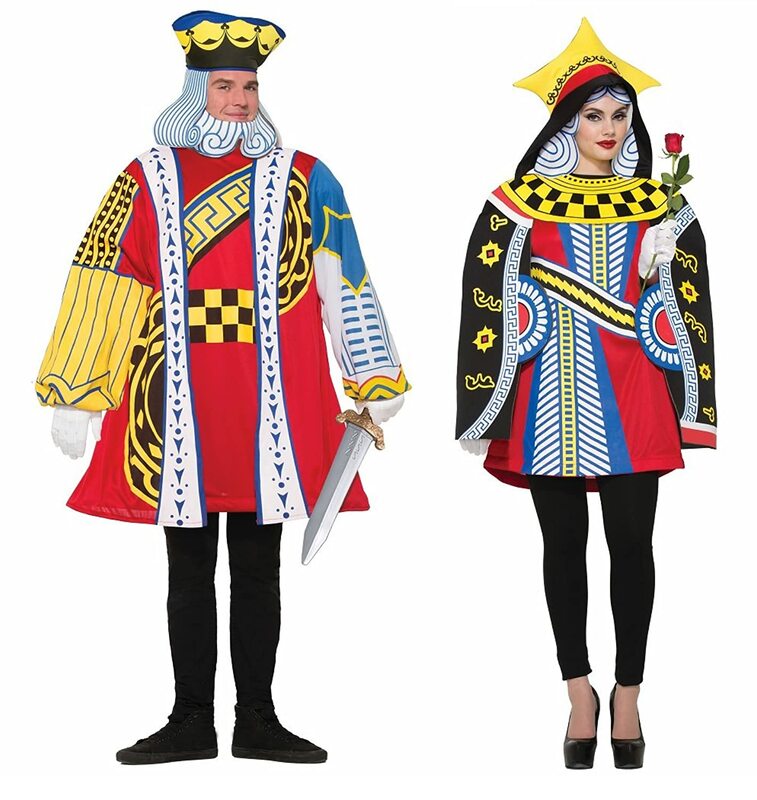 These King of Hearts costumes are ideal for couples costumes when matched with the Deluxe Queen of Hearts Costume featured above. The photo on the left is a great example of how fabulous these costumes look when they are paired together. The only other accessories I would add is a Queen of Hearts Scepter for the Queen to hold, a royal walking stick for the King, and a pair of fabulous black and white diamond patterned Queen of Hearts shoes for the Queen to wear. Nothing could be easier than to dress like royal playing cards from the Queen of Hearts court. It’s a sure bet you’ll have a regal good time! 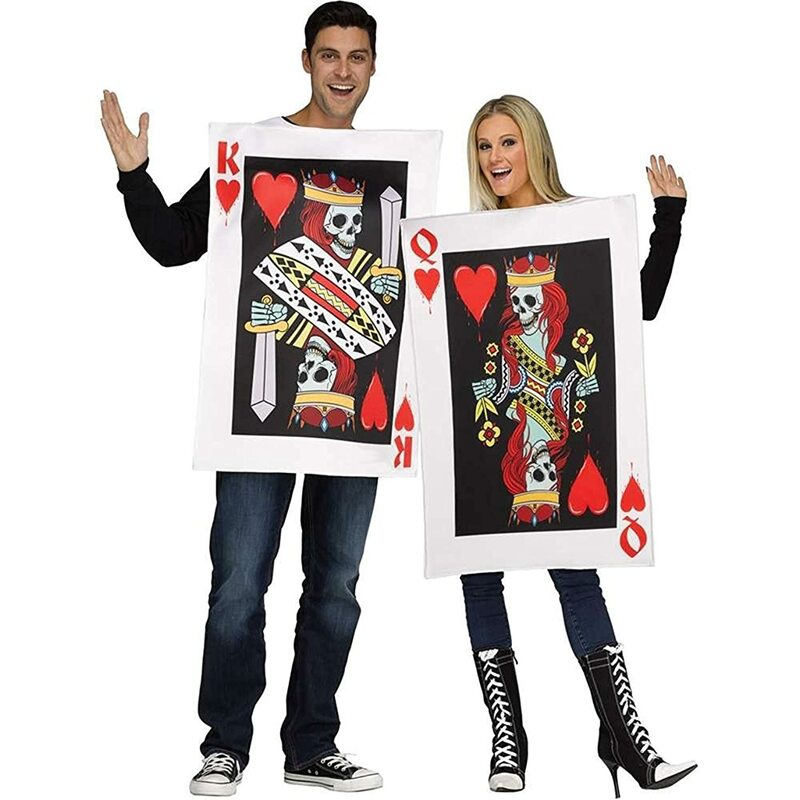 The playing cards costumes idea comes from the novel Alice’s Adventures in Wonderland where all of the Red King and Queen of Hearts court is made up of a deck of playing cards. I hope you have lots and lots of fun at your next costume event dressed as a Through the Looking Glass or an Alice in Wonderland Red Queen or Queen of Hearts! Look for a clear path to the Rabbit Hole, Stop Along the Way to Have Some Jolly Good Fun at a Mad Tea Party, and Share a Bit of the Magic Mushrooms with Your Friends! 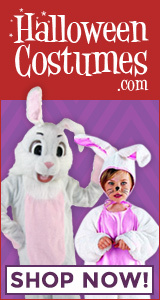 and put together your own personal Wonderland costume. Then visit my Red Queen Accessories pages to find ideas for the perfect Wonderland costume accessories. 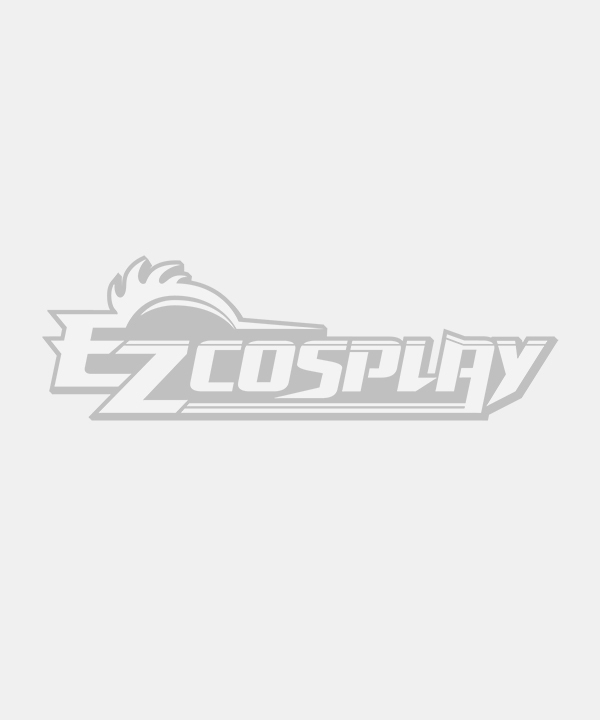 Accessories help to authenticate the look of your deluxe cosplay costume creations. can be found within the pages of this site. All my Red Queen Accessory pages are listed below for your convenience.